Theatre, dining, live entertainment and dozens of stores surround a 27-acre lake that lies alongside the Intracoastal Waterway. Wooden boardwalks, lush landscaping and more than 15 restaurants that serve lunch and dinner wind throughout Barefoot Landing. It’s a shopper’s paradise where good deals, unique gifts and vacation souvenirs are at every turn. Look around and you’ll notice that Barefoot Landing is fashioned after an old fishing village with four regions: Dockside Village, Boardwalk Shoppes, Carousel Courtyard and Waterway Shoppes. Explore all corners of Barefoot Landing, including the live entertainment at House of Blues’ concert hall and Alabama Theatre. 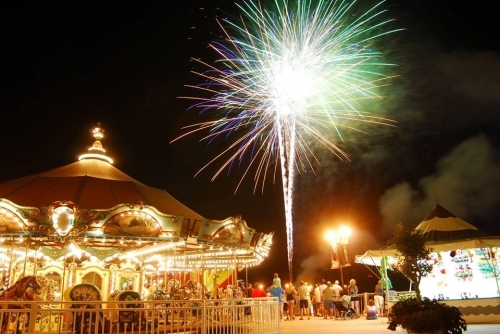 Fireworks, a riverboat cruise and Alligator Adventure round out the long list of family entertainment to be had at Barefoot Landing. Open daily. Visit the Barefoot Landing Welcome and Reception Center at Dockside Village for stroller rentals and complimentary wheelchair service.